A gummy smile is when a large portion of a person’s gums are visible when they smile. A gummy smile is a very common presentation and can result in a loss of self confidence in many people. In people who have a gummy smile their top lip stretches up high when smiling exposing the entire upper gum. This is usually due to over active muscles that work to elevate the upper lip. Other causes of a gummy smile include a short upper lip, excessive amount of gum tissue or small teeth – all of which are generic anatomical variations. Multiple studies conducted by dentists, plastic surgeons and dermatologists agree that the ideal smile shows only up to two millimeters of gum with anything over three to four millimeters of gum showing looks ‘gummy’. In the past the treatment options were extreme. Surgery has generally been the main treatment option with a procedure called a gingivectomy which removes excess gum tissue or surgeries to cut the muscles that lift the upper lip so it can no longer lift as high. Surgery is often painful, expensive and associated with significant down time and risks. One of the main causes, the excessive use of the upper lip elevator muscles, can now be treated in a simple and effective way. These muscles work to lift the upper lip when smiling and hence expose the gums, they can now be relaxed with simple muscle relaxing injections. The same muscle relaxing injections used as wrinkle relaxer are used to relax the upper lip muscle and hence reduce the appearance of a gummy smile. Relaxing the upper lip muscles to treat a gummy smile is a simple procedure involving the use of small amounts of wrinkle relaxing injections. It can be done at the same time as having wrinkle relaxing treatment to the upper face or any other area. It is convenient, safe and the results are dramatic. The procedure only takes 10 minutes and generally involves only 1-2 injections. There is a very small change of bruising or swelling to the injection site but the procedure is generally well tolerated. The results will last 3-4 months as with other wrinkle relaxing procedures. The important thing to note with this procedure is not to over treat the muscle. This could result in an unnatural look and even prevent the lifting of these muscles which are involved in smiling, eating and normal facial expressions. Correcting a crooked smile can be more difficult so it is important to be conservative with initial treatments. The gummy smile treatment with muscle relaxing injections can dramatically improve a persons self esteem and confidence. It really is one of the most satisfying procedures to perform as a doctor as you see your patient hesitant and too shy to smile one day to walking into your clinic 2 weeks later with a huge smile on their face and a new found sense of confidence. Relaxing the lip elevators can also be combined with the injection of dermal fillers to further enhance a result. By treating the upper lip with dermal fillers we can subtly add volume to help disguise the gum line (without having to drop the top lip down too much). 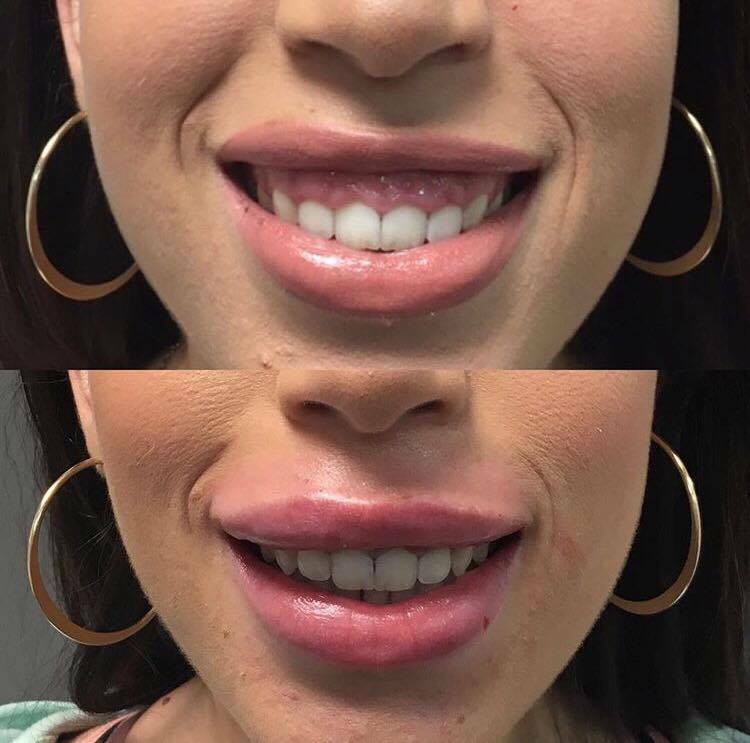 This not only improves the smile but can enhance the shape of the lips giving a more beautiful result. Dermal fillers can also be used to soften a gummy smile through strategic injection near the lip elevator muscles which works to put pressure on the muscle, making it less active. The photograph below shows the results after anti wrinkle injections to the lip elevator muscles as well as dermal fillers to the lips. The simple act of smiling activates significant neural pathways involved in mood and health. It is accepted widely in the scientific community that smiling can lift your mood as well as the mood of those around you, eases stress, strengthen the immune system and even lengthen our lives. Smiling is contagious. Smiling releases endorphins and serotonin. These act as natural pain killers, help your body to fight illness and act as an anti-depressant. Putting a smile on your dial can literally shift our mood and sense of wellbeing. This is why this treatment is so important. If someone comes to sees me and tells me they are too embarrassed to smile I am instantly concerned. My role is not only as a cosmetic doctor to improve their appearance. My training as a GP and training in mental health and preventative health also comes into play. 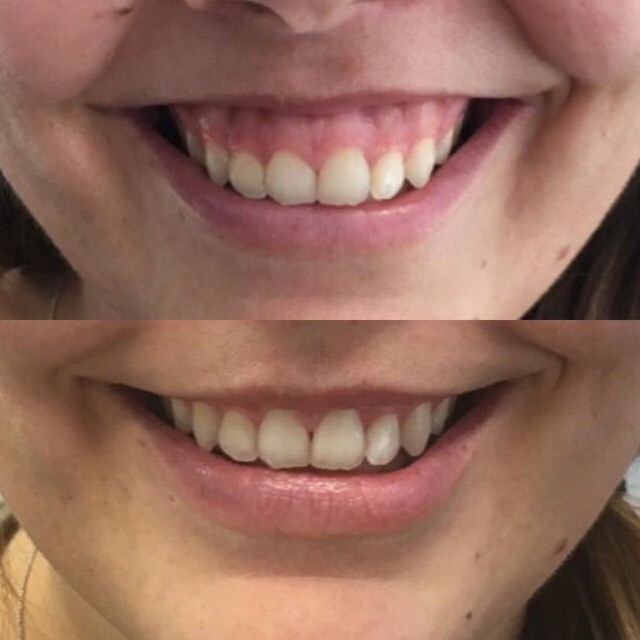 It makes my day when a simple procedure such as gummy smile treatment can transform a life so quickly. It makes me smile too. Wondering if we can treat your gummy smile? Book in a consultation with Dr Kate and find out.